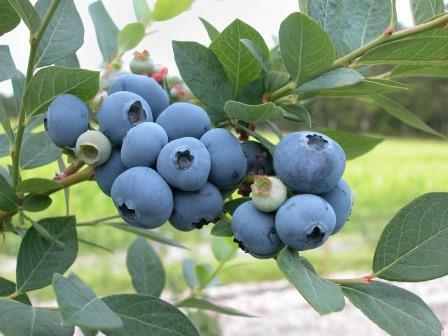 Blueberry bush. Picture courtesy skeeze from PixabayBlueberries are sweet, highly nutritious and wildly trendy right now because they have the highest antioxidant capacity of all the popular fruits and vegetables; earning them the label “superfood.” They are also easy to grow if the correct soil conditions are met, are resilient against pests and diseases, and will provide you and your family with an abundance of fruit for many decades to come – so you really go can’t go wrong with blueberries. 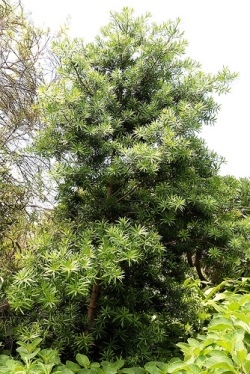 Podocarpus latifolius Picture courtesy www.kazimingi.co.zaEarly autumn is the best time to transplant evergreen shrubs and trees that are planted in the wrong place in your garden; whereas deciduous trees and shrubs are traditionally transplanted in mid-winter, when they have lost all their leaves and are totally dormant. As the temperatures drop in autumn, the day length decreases and plant sap slows down; thus reducing the shock and trauma that can occur when moving evergreen trees and shrubs which are actively growing. The soil is still relatively warm in autumn, giving the plants a chance to settle in before the weather really turns cold. The roots will continue to grow throughout winter, and in spring the plant will be ready to start shooting new top growth. 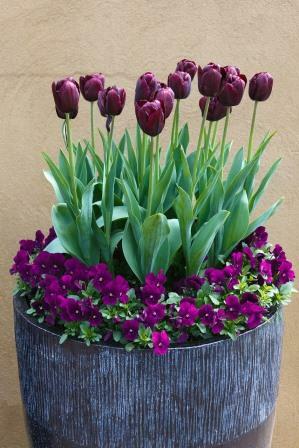 Give your garden a little attention in April and you will be rewarded with a riot of heart-warming flowers even in the dead of winter. Tulips & Violas grow beautifully in potsAs summer slowly draws to a close we can feel a definite drop in the morning and evening temperatures, and as the trees change colour and the veld grass starts to dry up, we are reminded that winter is nigh. 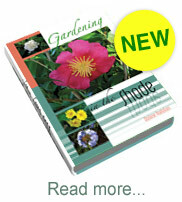 April is a wonderful month to garden and a busy month for gardeners in all regions of South Africa. 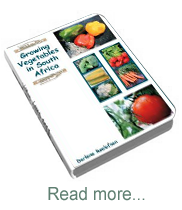 In the cold regions of the country, depending on when your first frosts arrive, April is generally the last month to sow winter and spring flowering annuals and winter vegetables. In the warmer, sub-tropical regions, sowing is usually 4 to 6 weeks later than the cold regions, so get stuck into your garden and prepare your beds for planting in May. Christof Lindequ. Picture courtesy www.ludwigsroses.co.zaThe last roses of summer are often the most perfect ones; and as the daytime temperatures drop, your roses will take on a new intensity of colour and unfading beauty seldom seen in hot weather. Their petals unfurl perfectly and they last much longer too. If the temperatures play along, you can have roses well into April and May. 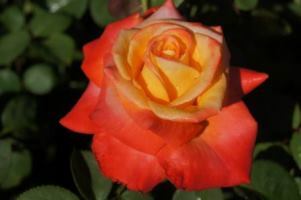 Shorter days are a signal to roses to prepare for winter dormancy and the plants start converting sugar to starches and storing it in their stems for their spring growth, so it is important to feed them regularly; especially in the summer rainfall regions. In very cold regions, you should stop feeding by mid-March as this will harden them off against the cold. Lower daytime temperatures and reduced evaporation also mean that you can reduce the amount you water, while still ensuring good moisture in the soil. 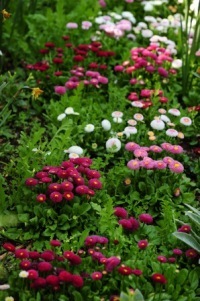 Bellis perennis Picture courtesy www.lifeisagarden.co.zaIn cold winter regions which experience early frosts, gardeners generally start planting out trays of winter seedlings, or sowing seeds directly into garden beds, once the soil temperatures have cooled down significantly in autumn. 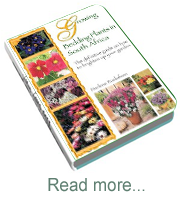 In subtropical and humid regions, late summer, autumn and winter are the best times to plant a flower garden; and many winter annuals, as well as summer flowering annuals are sown during these cooler months. 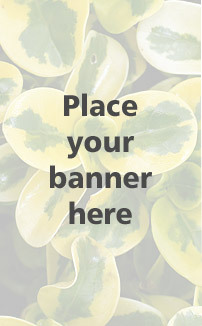 Sowing and planting times vary from region to region, and not all so-called “winter annuals” are fully hardy to frost, so it is always best to check with your local garden centre to ensure that you plant the correct varieties at the right time. Remember to water the beds and the trays of seedlings thoroughly the day before planting out, and always plant in the cool of the morning or late afternoon. To avoid damaging the seedlings, gently coax them out of their trays by pushing them out from below. A common mistake gardeners make is to plant their seedlings too deep - never bury the stems or cover their crowns with soil, as this can cause them to rot. Water well after transplanting and keep the soil moist but not soggy until they are established. If you are planting a mixture of seedlings, remember to group plants which have the same watering requirements together.